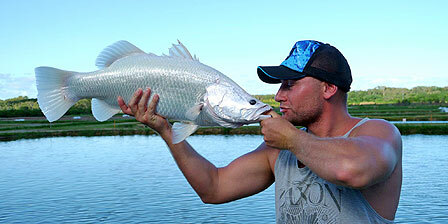 Daintree Saltwater Barramundi Fish Farms is credited as the best in Australia. As well as being winners of multiple awards at the prestigious Sydney Fine Food Show, for their ‘Plate Sized Barramundi’ and ‘Large Whole Fish Barramundi’, they also passed a stringent food safety assessment to be approved for inclusion in the EU certification program and are Safe Food Queensland certified (121541-000). The farm is located on a 49 hectare property, positioned on the shores of the southern arm of the Daintree River in Tropical North Queensland. It has 3.3 hectares of licensed production ponds, which are comprised of 12 production ponds, 1 fingerling pond and 1 pond which is utilised for recreational Barramundi fishing. Daintree Saltwater Barramundi Fish Farms is a 90-minute drive north of Cairns and half an hour from Port Douglas. The farm is immaculately presented and adheres to best practice guidelines in all areas of operation. From sourcing the finest salt water from the nearby Daintree River to fill its large earthen ponds, to maintaining them at a standard replicating the natural environmental conditions favoured by the Barramundi, to letting the fish mature naturally over a 12 – 18 month period. Owned by an Australian company, Daintree Saltwater Barramundi Fish Farms has long term local Daintree resident, Mark Hober, as a director of the board and manager of the farm. 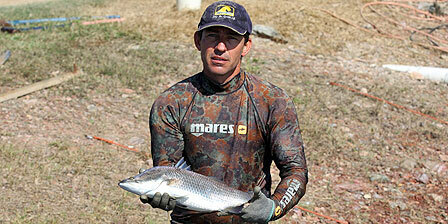 Mark has always been passionate about Barramundi and grew up fishing in the Daintree River. He started his professional career as a diesel mechanic, in the region’s sugar mills, before being lured into the farmed Barramundi industry in 2001. Mark started at the farm as Manager and became a director of the board in 2011; he retains this position and his management responsibilities, to this day. Mark and his team are focused on best practice operations and are constantly expanding the facility, with a view to increasing its productivity and output at the farm gate. By choosing Daintree Saltwater Barramundi Fish Farms as your preferred Barramundi supplier, you are supporting Australian employment, industry and innovation. You are also supporting sustainable fish production and ensuring you receive a quality Barramundi product which not only tastes great, but is compliant with the strictest environmental and health requirements in the world. Barramundi farm fishing is now possible on-site, thanks to the opening of the recreation centre and popular Hook-A-Barra business. Hook-A-Barra is open 7 days a week (CLOSED Christmas Day, Boxing Day and Good Friday & Anzac Day)* and provides anglers of all ages and abilities the opportunity to catch a Barramundi or Mangrove Jack, in the farm’s multispecies pond. Expert guidance is provided by staff on site and all tackle and bait are provided and included in the fee. Barramundi fishing at Hook-A-Barra costs $56 per person, per hour and is catch and release with the opportunity to purchase your take, at an additional $14 per kilo. Non-fisher guests are charged $10 general admission, which provides access to the farm’s aquarium, the chance to feed the Barramundi and watch the anglers land a great sporting fish. For more information phone (07) 4098 7117. * Note: Opening hours may be reduced during the wet season (January – March), please phone for updates. Daintree Saltwater Barramundi Fish Farms is an active member of the Australian Barramundi Farmers Association.